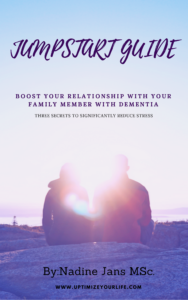 You are helping a family member with dementia. And yet it is so incredibly hard in the heat of the moment when you’re angry or frustrated! I remember one of my clients, Sally, from years ago. She lived with her husband, who had early onset dementia. He forgot a lot of things. He put things in the wrong place. Every day they wasted a lot of time searching for his wallet or his keys (or both). She always helped him, and luckily most of the time they found what they were looking for. She figured that having a little basket in their hallway next to their front door would be very helpful. This would be the place where he would leave his keys, wallet, and sunglasses. It would make life way easier. But there was one problem.. He didn’t put his things in the basket. Not even when she reminded him. He felt it was not necessary. In fact, he felt she was exaggerating. … and it escalated into a big fight. Sally had been very patient, but she got so upset and frustrated with him. She even considered a divorce. 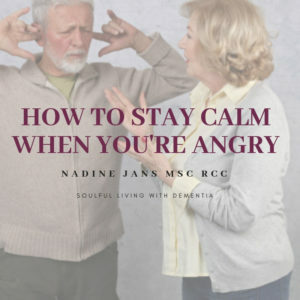 Even though you really want to discover the secrets of how to stay calm, in the heat of the moment you might not care anymore. This is exactly what Sally felt. If this happens to you, please know it’s not your fault. It’s not because you are a mean person or don’t care enough. It happens because you really care. Your emotional brain hacks you and takes over. That’s why you are only able to react—without thinking. This is a natural and normal process. At some point we can all get into the fight-or-flight state. Fortunately, there are powerful ways to overcome this! And right now, the most important first step is to think about WHY it is so important that you stay calm. Almost always, nobody gains anything by fighting or reacting to triggers. Your personal values play an important role, and staying calm helps you act according to your values and continue being the person you really want to be. Often, when we’re not calm and when emotions take over, we react in the moment without control. This is when we may start to yell or do things we later regret. The regret is a sign we’ve acted in a way that doesn’t align with the person we want to be. Understanding your values and what matters to you and who you want to be, becomes your compass. As a caregiver for a person with dementia there is another factor and it is hugely important. In order to cope in a better way and in order to not take it so personally, understanding how the brain changes and how this affects behaviours, moods, and relationships, will help you make sense of everything! If you don’t understand the brain with dementia, you might not recognize the behaviours as the result of brain changes. Far more often brain damage is subtle and hidden, and when you don’t know it’s there, it’s hard to recognize the common pitfalls and to know how to avoid the common mistakes. he was also experiencing problems in thinking and reasoning. He didn’t see the bigger picture anymore and didn’t fully understand why it was so important to Sally to have this basket, as a result of the brain damage. He forgot that it was there because of his memory problems. Basically he forgot he had a problem. Sally didn’t know this and she thought at some point that he was just a mean and selfish man—because she didn’t recognize and understand the changes in his brain. Once you understand a changing brain, you know it’s not personal and it becomes easier to stay calm. In the end, that is what will help you and your person. You can then start to tell yourself something like, “No matter what, if I feel triggered (because that will continue to happen, perhaps less often), it’s not personal and I am not going to react. I’ll take a deep breath. This can become your new default response. Be gentle with yourself and allow your feelings and thoughts to flow freely. Create space. Acknowledge your emotions, and don’t try to fight them. There is nothing wrong with your feelings. Breathe! The breath is a simple but powerful tool for controlling your emotions. Long, deep breaths will calm your nervous system in seconds! Act in the direction of your values. Leave if possible (if that helps) and come back later. And… when things get ‘messed up’ in the heat of the moment…. anger can be a sign of burn-out.. reach out for help. … it comes with ups and downs.. I wonder… what helps you to stay calm?